SAINT-PAUL-LEZ-DURANCE, France — At a dusty construction site here amid the limestone ridges of Provence, workers scurry around immense slabs of concrete arranged in a ring like a modern-day Stonehenge. First discussed in 1985 at a United States-Soviet Union summit, the multinational effort, in which the European Union has a 45 percent stake and the United States, Russia, China and three other partners 9 percent each, has long been cited as a crucial step toward a future of near-limitless electric power. “I do believe we are moving at full speed and maybe accelerating,” Dr. Bigot said in an interview. Pieces of the tokamak and other components, including giant superconducting electromagnets and a structure that at approximately 100 feet in diameter and 100 feet tall will be the largest stainless-steel vacuum vessel ever made, are being fabricated in the participating countries. Assembly is set to begin next year in a giant hall erected next to the tokamak site. There are major technical hurdles in a project where the manufacturing and construction are on the scale of shipbuilding but the parts need to fit with the precision of a fine watch. Even if the project proceeds smoothly, the goal of “first plasma,” using pure hydrogen that does not undergo fusion, would not be reached for another eight years. A so-called burning plasma, which contains a fraction of an ounce of fusible fuel in the form of two hydrogen isotopes, deuterium and tritium, and can be sustained for perhaps six or seven minutes and release large amounts of energy, would not be achieved until 2035 at the earliest. That is a half century after the subject of cooperating on a fusion project came up at a meeting in Geneva between President Ronald Reagan and the Soviet leader Mikhail S. Gorbachev. A functional commercial fusion power plant would be even further down the road. Fusion is also very expensive. ITER estimates the cost of design and construction at about 20 billion euros (currently about $22 billion). But the actual cost of components may be higher in some of the participating countries, like the United States, because of high labor costs. The eventual total United States contribution, which includes an enormous central electromagnet capable, it is said, of lifting an aircraft carrier, has been estimated at about $4 billion. Despite the recent progress there are still plenty of doubts about ITER, especially in the United States, which left the project for five years at the turn of the century and where funding through the Energy Department has long been a political football. Dr. Bigot met with the new energy secretary, Rick Perry, last week in Washington, and said he found Mr. Perry “very open to listening” about ITER and its long-term goals. “But he has to make some short-term choices” with his budget, Dr. Bigot said. Energy Department press aides did not respond to requests for comment. Some in Congress, including Senator Lamar Alexander, Republican of Tennessee, while lauding Dr. Bigot’s efforts, argue that the project already consumes too much of the Energy Department’s basic research budget of about $5 billion. “I remain concerned that continuing to support the ITER project would come at the expense of other Office of Science priorities that the Department of Energy has said are more important — and that I consider more important,” Mr. Alexander said in a statement. 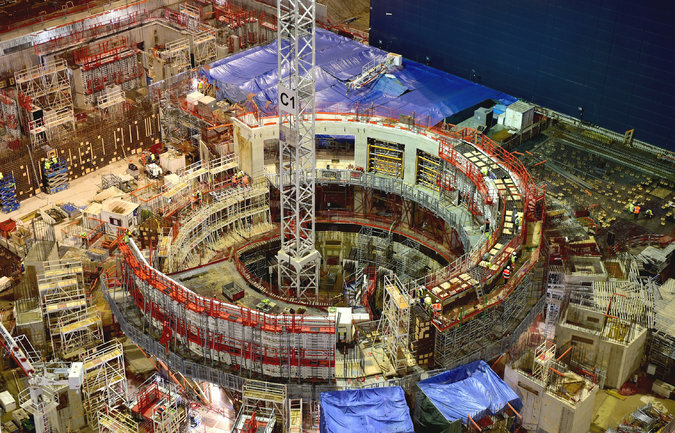 But even scientists who support ITER are concerned about the impact it has on other research. In the ITER tokamak, deuterium and tritium nuclei will fuse to form helium, losing a small amount of mass that is converted into a huge amount of energy. Most of the energy will be carried away by neutrons, which will escape the plasma and strike the walls of the tokamak, producing heat. In a fusion power plant, that heat would be used to make steam to turn a turbine to generate electricity, much as existing power plants do using other sources of heat, like burning coal. ITER’s heat will be dissipated through cooling towers. There is no risk of a runaway reaction and meltdown as with nuclear fission and, while radioactive waste is produced, it is not nearly as long-lived as the spent fuel rods and irradiated components of a fission reactor. To fuse, atomic nuclei must move very fast — they must be extremely hot — to overcome natural repulsive forces and collide. In the sun, the extreme gravitational field does much of the work. Nuclei need to be at a temperature of about 15 million degrees Celsius. In a tokamak, without such a strong gravitational pull, the atoms need to be about 10 times hotter. So enormous amounts of energy are required to heat the plasma, using pulsating magnetic fields and other sources like microwaves. Just a few feet away, on the other hand, the windings of the superconducting electromagnets need to be cooled to a few degrees above absolute zero. Needless to say, the material and technical challenges are extreme. Although all fusion reactors to date have produced less energy than they use, physicists are expecting that ITER will benefit from its larger size, and will produce about 10 times more power than it consumes. But they will face many challenges, chief among them developing the ability to prevent instabilities in the edges of the plasma that can damage the experiment. Even in its early stages of construction, the project seems overwhelmingly complex. Embedded in the concrete surfaces are thousands of steel plates. They seem to be scattered at random throughout the structure, but actually are precisely located. 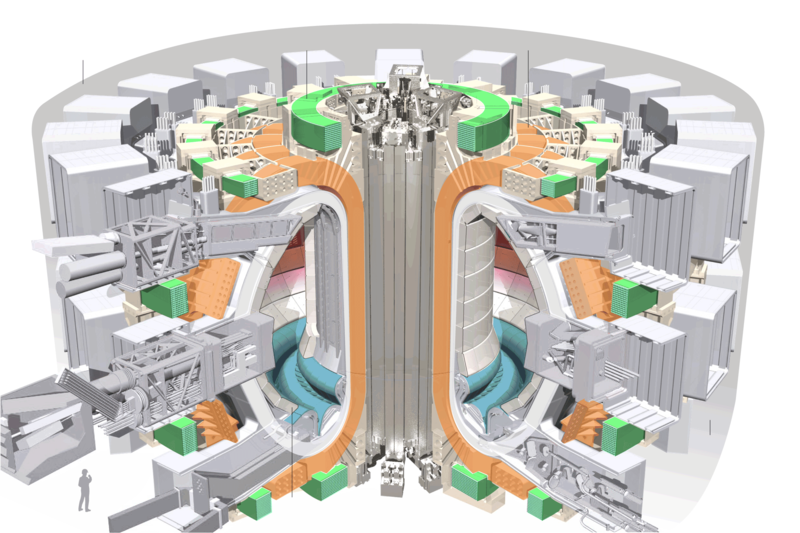 ITER is being built to French nuclear plant standards, which prohibit drilling into concrete. So the plates — eventually about 80,000 of them — are where other components of the structure will be attached as construction progresses. A mistake or two now could wreak havoc a few years down the road, but Dr. Bigot said that in this and other work on ITER, the key to avoiding errors was taking time.